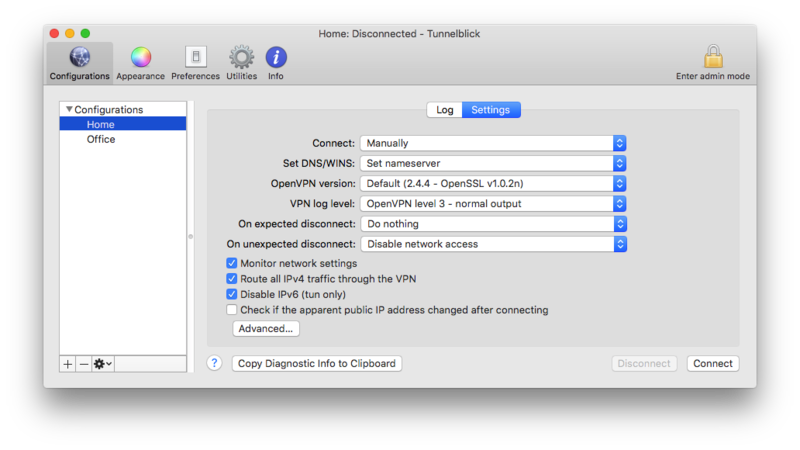 Tunnelblick's Kill Switch - Tunnelblick | Free open source OpenVPN VPN client server software GUI for Mac OS X. The "kill switch" is available in Tunnelblick 3.7.5beta05 and higher. Tunnelblick has a "kill switch" that can disable all network access if the VPN disconnects. This can be useful when running an application (for example, a BitTorrent client) that you do not want to "leak" data outside of the VPN. It is not a "firewall", which can prevent all network access except through the VPN. The difference is like the difference between a door that automatically closes when there's a fire (the "kill switch"), and a door with a doorman who only lets people through if they are going to a particular destination (the "firewall"). The kill switch should not be used when more than one VPN is connected at the same time. Network access is disabled until you re-enable it, even after you restart your computer. If Tunnelblick or OpenVPN are not running, network access will not be disabled. For example, if your computer crashes, network access will be enabled when it restarts. Tunnelblick's kill switch is controlled separately for each VPN you have (but see Changing Multiple Settings at Once), and it can be set up to be triggered by expected and/or unexpected disconnections. In the above screenshot, which has the "Home" VPN selected, "On expected disconnect" is set to "Do nothing" (kill switch inactive) and "On unexpected disconnect" is set to "Disable network access" (kill switch active). If there is an expected disconnection, nothing special will be done. If an unexpected disconnection occurs, however, all network access will be disabled. Network access will be disabled until you re-enable it. You can do that using Tunnelblick's "Re-enable Network Access" menu command. If network access has been disabled when you quit or launch Tunnelblick or try to connect a VPN, Tunnelblick will ask if you want to re-enable it. Launch System Preferences, and click on "Network". For each network service that is labeled "Inactive"
Click on "Make Service Active". If you wish, turn Wi-Fi on. You can use the Wi-Fi icon in the menu bar, or, in the "Network" System Preferences, select the Wi-Fi service in the list on the left and then click the "Turn Wi-Fi On" button.